Moderating a focus group discussion or depth interview is easy and fun if you prepare well. A moderator is a director, conductor, and juggler. Learn the standard technique to start a group or depth interview. Discover how to introduce main topics of inquiry. And how to keep a dialogue on track and within your time limits. Also, learn how to handle trouble. Find out how to close a group or interview, and confirm what is important to respondents. You may hear some new topics of importance too. Learn the basics of unaided and aided memory recall. Recognize the 5 major types of bias in qualitative research and minimize it. Discover how to deal with the subconscious mind in a focus group discussion or depth interview. Are you planning to moderate a focus group or depth interview? Here is a checklist and tips to conduct focus groups or depth interviews. The first step in moderating a focus group is building rapport with respondents. Rapport opens discussion. Here is a handy checklist to build rapport with respondents. Moderating and conducting focus groups starts with building rapport and introducing topics. Discover how to introduce topics for discussion in qualitative marketing research focus groups. Bias in qualitative research affects the validity and reliability of findings, and consequently affects decisions. Know the five major categories of bias in qualitative research. Unaided recall and aided recall are methods to retrieve information in qualitative focus groups. Find out how to do it. Emotions, beliefs, and cultural conditioning shape perceptions and influence buying behavior. They linger in the subconscious mind. 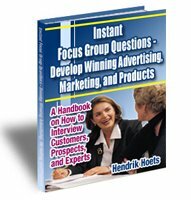 Discover how to identify them in qualitative focus groups. Has the tight economy slashed or trimmed your marketing research budget? Instead of focus groups, consider telephone depth interview research to save money. Here’s how to do it. Marketing Channels – Who Should Conduct Depth Interviews? Need insights from marketing channels - distributors, retailers, dealers and agents? Find out why you don’t want the sales team running depth interviews. Focus group training is a essential, if you are thinking about a career as a qualitative research professional. Find out where to get training.